This two bedroom, one bathroom apartment has a large open concept living area with formal dining space. 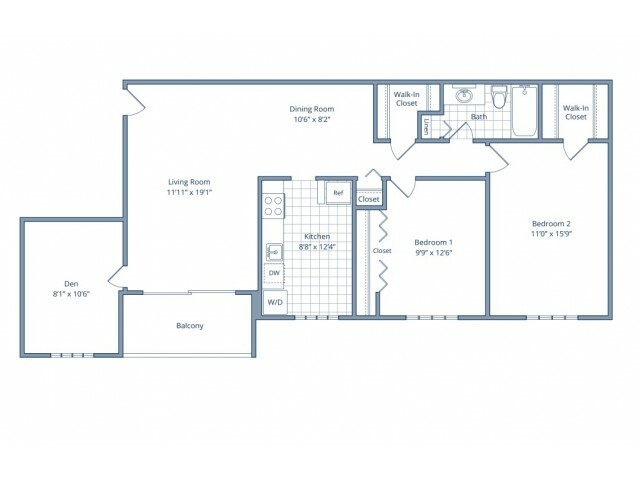 The Magnolia Alt 1 floor plan features a large bedroom with walk-in closet, separate den/study, washer and dryer in unit, and private balcony. Seasons at Bel Air is a pet friendly community. We currently accept a maximum of 2 cats or 2 dogs with the exception of the following breeds: Pit-bulls, Rottweilers, Chows, Akitas, American Staffordshire, Shar-Pei, Bull Terriers or any aggressive breed. Maximum weight is 50 lbs. at maturity. A signed pet addendum is required at the time of move-in. A $200 deposit/fee ($100 refundable), per pet is required at the time of move-in, along with a $25 monthly pet rent per pet.